December 12, 2018 | USA: Chesapeake VA | Source: Clean Energy Fuels Corp.
Clean Energy Fuels reports that for the City of Chesapeake, VA, a journey that started in September 2012 advanced this week when its millionth gallon of compressed natural gas (CNG) was dispensed into the city’s fleet vehicles. 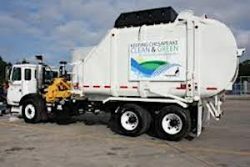 What began as six trucks running on Clean Energy’s diesel-alternative fuel has grown to a fleet of 50 CNG solid waste trucks now in service. Natural gas is cleaner and greener than diesel, something that has benefited the city a million times and counting.